The ATLAS experiment has continued to record data and to refine the analyses in the search for the Higgs boson and many other exciting signatures of new physics. The latest results are being presented at the Lepton Photon 2011 symposium in Mumbai, India, 22-27 August 2011. 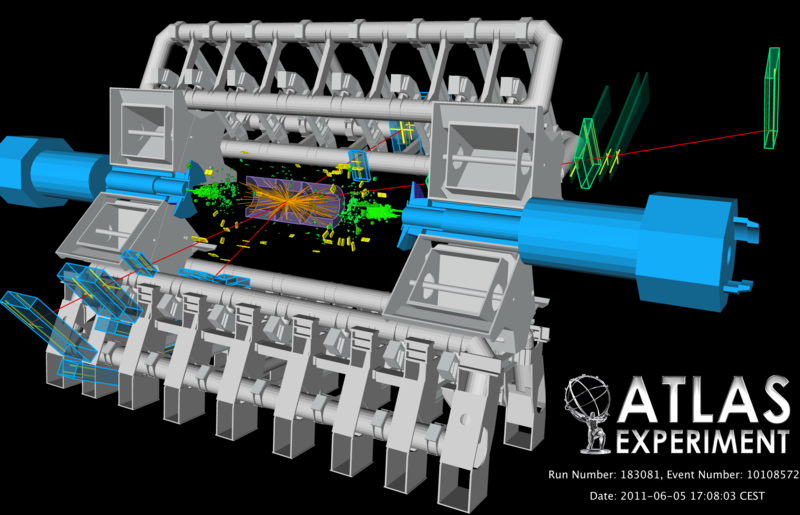 Since the previous meeting (the European Physical Society — EPS, Grenoble, France, 21-27 July 2011), the LHC has almost doubled the data provided to ATLAS. Among the most awaited results are those related to the searches for the Higgs boson. The Higgs boson was proposed to explain the mystery that the photon (the particle of electromagnetic forces) has no mass, whereas the particles of the weak force, the W and Z bosons, have substantial masses. In the Standard Model, weak and electromagnetic interactions are different manifestations of the same theory, so this difference in masses requires an explanation. The theory says that W and Z bosons acquire mass through complex interactions with a particle called a "Higgs" (after theorist Peter Higgs). The interactions with Higgs bosons "break" an important symmetry of nature, the electroweak symmetry, and thereby give mass to all fundamental particles (electrons, muons, quarks, W and Z bosons, etc.). This origin of the masses of all fundamental particles is one of the most outstanding issues in particle physics. In the quest to determine if the electroweak symmetry is indeed broken by the Higgs boson or some other mechanisms, it is important to look across the full range of possible masses that the Higgs boson might have (earlier experiments ruled out masses below 115 GeV). So for every value of the Higgs boson mass, we look for the signals it would produce. We can already say that some Higgs masses are strongly disfavoured — we talk about "excluding at the 95% confidence level (CL)", meaning that there is less than one chance in twenty that the Higgs has this mass. The Higgs boson can decay into a variety of different particles, and searches in ATLAS currently cover nine different decay modes. The latest data reported at this conference extend the excluded mass ranges beyond those presented at the EPS meeting. In fact, in the latest results, 85% of all mass regions below 466 GeV are excluded at the 95% CL. This leaves three mass regions where the Higgs discovery is most likely: 115-146 GeV, 232-256 GeV, 282-296 GeV plus any mass above 466 GeV. At the EPS meeting in July, ATLAS and CMS reported that a few more events than expected had been seen in one mass region, described in the news media as a possible hint for the Higgs boson. However the latest results do not show any additional enhancement of these hints — but we are still in the early days of this search. By the end of 2011, this data sample may double again, and increasing statistics can take these Higgs search results in either of two directions: 1) if this excess of events sees no further enhancement, we may be able to exclude portions of the mass region of the excess at the 95% CL, or 2) if the excess increases, the excitement level will rise, but it may take yet another year's data to determine if we can announce a discovery. Still another good possibility is that the Higgs boson may instead appear (after much more data is collected) at a different mass to which we are not as sensitive yet. This could be at lower mass or higher. Part of the excitement of science is this bumpy rollercoaster ride with many twists and turns. Only time and the hard work by many hundreds of ATLAS collaborators will determine what nature has in store for us. We are indebted to our LHC accelerator colleagues for delivering collision data at a phenomenal and unexpected rate. This figure shows the expected and observed sensitivity of the search for the Higgs that arises from combining the results of searches in all decay modes studied to date. The black undulating dashed line shows ATLAS' predicted sensitivity to the Higgs boson in the mass range 100-600 GeV, based on simulations. The green and yellow bands correspond to the uncertainty in these predictions. The solid black line shows ATLAS' limit on Higgs production based on actual data collected. The plot shows that, with one inverse femtobarn of data collected, ATLAS can exclude with 95 per cent confidence the existence of a Higgs wherever the solid line dips below the horizontal dashed line at 1. Many mass regions are excluded. In some other regions, there are small excesses above expectations. Event with four muons, compatible with the hypothesis of Z pair production. symposium. This includes many detailed measurements of the properties of the Standard Model, an essential step in distinguishing new physics from Standard Model processes and particles. Especially impressive are the detailed studies of the properties of the top quark. The searches for new physics include those for quark substructure, axigluons, leptoquarks, extra dimensions of space, new forces of nature (W-prime and Z-prime bosons), particles predicted by supersymmetry, a fourth family of quarks, exotic particles decaying to an electron and a muon, particles decaying to a top quark and an anti-top quark, and more. The results ATLAS is reporting at the Lepton Photon symposium are fascinating physicists, and are just the tip of the iceberg. The phenomenal and still increasing collision rate at the LHC will lead to huge increases in the data totals. The powerful and ever advancing analyses will then lead to great strides in our understanding of the nature of our universe. representative selection of the available results is shown.